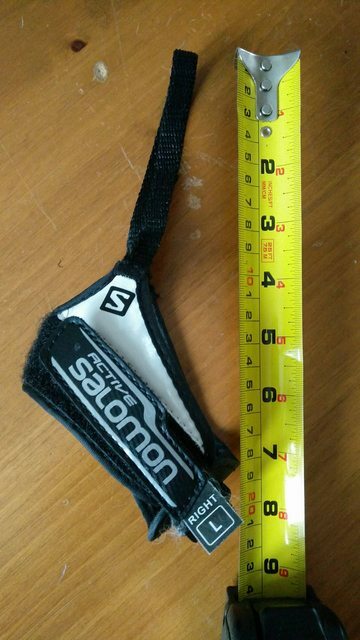 I bought these cross country ski poles from Salomon. The straps are insanely short. I have very small hands for a guy, and with a (very) thin glove, the velcro hook/loop barely makes a connection. 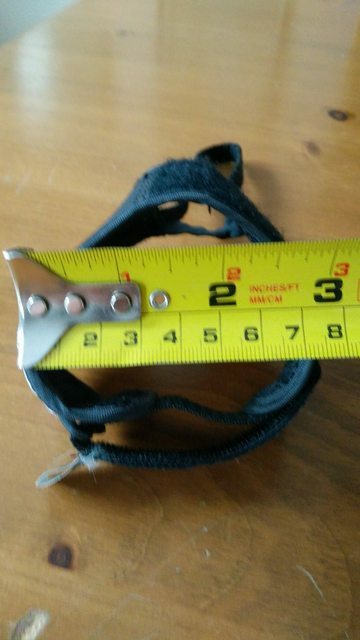 As you see, the diameter, when stretched out to the widest is about 3 inches. Am I doing something wrong? I want to wear thicker gloves.... Thoughts, comments, ideas? The straps are supposed to be short, it helps give you more power on your pole stroke, and keep better control of you poles. When you properly fit your straps, you're supposed to adjust them short enough be able to draw your poles behind you and lift them off the ground with your hands open. This gives your hands an opportunity to relax in the latter part of your pole stroke, and when bringing your poles back to your front. You don't want to be able to drop your poles out of your grip, but you want to be able to let your grip loose without fumbling to get it back. Your pole straps are made for fast powerful pole strokes on long poles. you only wear light gloves with that style of strap because when you're racing you stay warm from staying active, you don't wear thick clothes or gloves because you'll overheat and sweat like crazy. If your hands are getting cold, then you're probably not staying active enough. You may want to look at more of a recreational pole strap if you want to slow down and ski more leisurely. Not the answer you're looking for? Browse other questions tagged gear skiing cross-country-skiing or ask your own question.